Good funhouse. The moving ARK was the only park that really threw me, but its a nice attraction overall. Not quite as good or as much fun as FRANKENSTEINS HAUNTED CASTLE at IB or as I remember the UPSIDE DOWN HOUSE to be at CP, but definitely a nice treat. Did laugh when some of the relatively simple stunts still scared grown people LOL. This ride is cool on a really hot day becuase you can go inside and cool off. Nice theme and great effects. Better for smaller kids. This type of Fun House used to be available at many parks worldwide. Now only a handfull of parks have anything like it and Noahs Ark is the only one of its type left in North America and one of only two or three in the world. 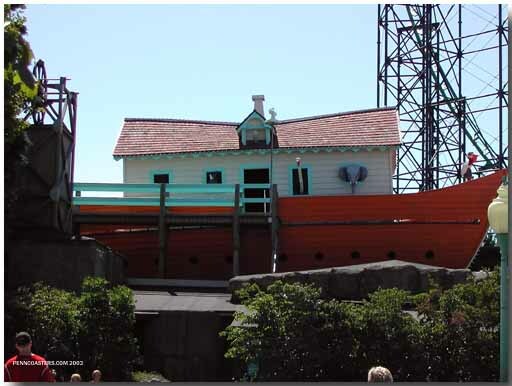 This attraction has a fun factor multiplied by its rocking motion. Ever tried to walk down steps at the end of a rocking ship? The many effects and stunts inside make this a DO NOT MISS attraction. By far the best fun house type ride Ive ever been on!! The rocking boat, the spooky animals, its all just a ton of fun! A great ride that proves again how neat Kennywood is. The best fun house I have ever been in. Lots of gags, shaker boards, a rocking stairway, and it is all in great shape. It has a great ending as well. Get there early, as the lines for this can get very long. For fun houses this is a fun one. But it is what it is a fun house and they are only average rides. Excellent fun! The rocking effect, the animatronics, the elevator, the finale, the dungeon all comes together nicely. Not to mention the best shaker boards in the country! A very fun walk though that has not been "tamed down" for our litigation happy society... the boat still rocks, even as you go down the one flight of steps inside... easy to lose your balance... "theme parks" would have either removed this or stopped the rocking so "no one will get hurt" and sue. There are also a few surprises that will catch you of guard. I think it is the only one left in North America and one of the two or three left in the world. Another unique ride for Kennywood. The beginning part of the ride is as if you are entering the excavation site. You ride in a rickety old elevator down to the digging. Once out of the elevator there is a great effect of walking on planks over trenches of skeletons. This part did scare my 4 year old, so be aware. After this you walk into the rocking boat and see the animals in the ark. I really liked the ending, being near a giant tank of water about to explode. This was also too much for the youngsters. Keep this in mind if youre thinking about taking the little ones on this ride- most of it they will like, but there are a few elements that may frighten.